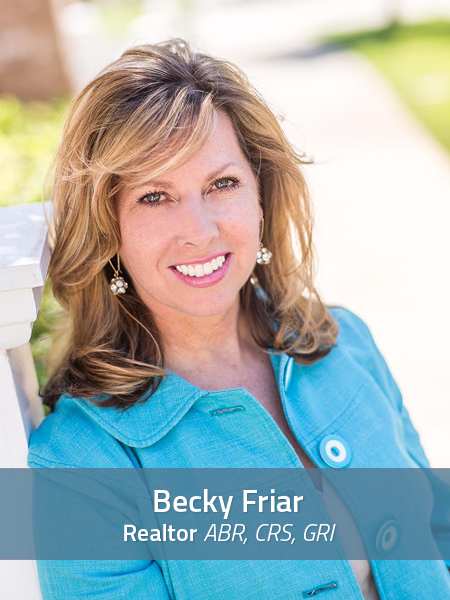 Becky takes pride in being tuned in to her client’s realty needs; calming concerns and lending a listening ear is her specialty! Buying and selling can be an exciting process, and it doesn’t have to be a stressful one, not with Becky’s able assistance. Her excellence in Real Estate shines in her uncanny ability to know the value of your home and to know what the local market can produce. For twenty years now, she’s been guiding people through the marketplace with the ease of long practice. What first attracted you to this business? I thought I could set my own hours – which turned out to be Real Estate Myth #1. What do you remember about your first home sale? I sold it quick and I thought being a Realtor was going to be easy–which turned out to be Real Estate Myth #2. One piece of advice for a buyer? Choose a Realtor who knows your particular market well! Why NOT focus on the POSITIVE! If you pursue happiness, it will elude you. But if you focus on your family, your friends, the needs of others, your work and doing the best you can, happiness will find you. One piece of advice you would give to a seller? Choose a Realtor who will tell you what you need to know … which is not always what you want to hear.